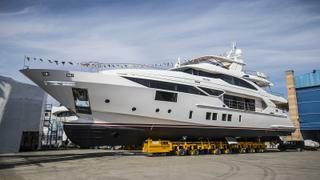 Italian yard Benetti has announced that the fifth and sixth yachts in its Fast 125 series, My Way and Charade, have splashed down in Viareggio ahead of a planned summer delivery. 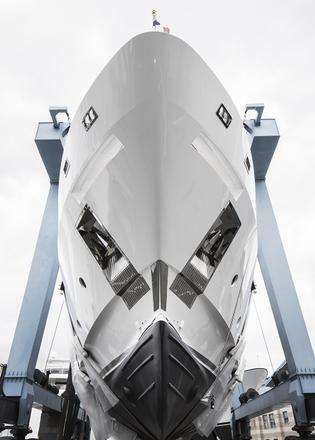 Built from a GRP hull and superstructure, these 38.1 metre sisterships both feature sporty exterior styling by Stefano Righini and naval architecture by Pierluigi Ausonio. British studio RWD created the Air décor scheme, which was used on both yachts, bringing a bright and contemporary atmosphere to the 320GT interior. Accommodation is for up to ten guests split between five staterooms, including a main-deck owner’s suite and four VIP cabins on the lower deck. Al fresco relaxation options are plentiful, with a pair of superyacht spa pools situated on the foredeck and upper deck. Power comes from a pair of 2,600hp MTU 16V2000 M94 diesel engines linked to Azipull C65 poddrives for a top speed of 24 knots and comfortable cruising at 18.5 knots. When trimmed back to their economical speed of 12 knots, both Charade and My Way should boast a cruising range 1,750 nautical miles, drawing on a total fuel capacity of 25,000 litres, figures that will be put to the test on their forthcoming sea trials. Other superyacht projects currently under development at the Italian yard include the fourth Mediterraneo 116 yacht, which is due for delivery next summer.